The Geek Travels: Ten Tribes, One Vibe. Now there's a valid reason to spend the long weekend here in Davao! Dubbed as the 'King of Festivals', Kadayawan Festival is celebrated every third week of August. The said festival is an annual thanksgiving celebration for the bountiful blessings that the city received. Collage of my Kadayawan shots, taken last year. It will still follow last year's theme: Ten Tribes, One Vibe. The tribes of Ata, Matigsalug, Ovu-Manuvo, Klata-Djangan, Tagabawa, Tausog, Maguindanao, Maranao, Kagan, and Sama are the ethnic groups that comprised the 10 different tribes of Davao. Kadayawan Festival has officially started yesterday and its highlights, such as Indak-indak sa Kadalan, Hiyas ng Kadayawan and Pamulak are slated on the third week. Kadayawan Festival brings this festive mood to everyone as tribes and locals greet you "Madayaw", a local word which means "good". One can surely expect that this year's Kadayawan Festival will be bigger and bolder. Last year, I had the chance to cover the Kadayawan Festival and I really had a blast, despite the scorching heat of the sun! The streets were so colorful and the city has never been THAT lively! Here are some of my shots during the Indak-indak sa Kadalan. All photos were taken using my Canon A480, a point-and-shoot camera. 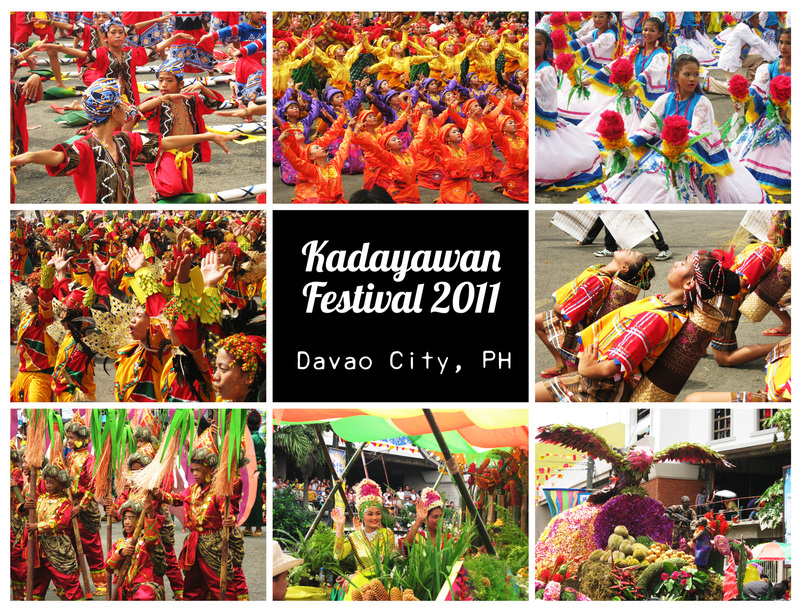 Fly to Davao and experience Kadayawan Festival, the King of Festivals. Renz, how far is Davao from Surigao? We'll be there kasi Aug 21 - 25. Masarap gumala muna sa Pinas bago sa ibang bansa. Kelan kaya ako maka pag plan ng Adventure dyan. nice photos! cant wait for the festivities to really begin! When we talking about festivals,,it's very great here in our country because we really give an effort for it ,,Like as what I see from this photos they are very enjoying,,They very prepared for their amazing presentations...I really love it..
Kadayawan is such a festive event. I saw one a few years ago and hope to get back to Davao to witness it again. i plan to visit davao... pero next year pa and not in august pa talaga. i guess i'll just have to see snippets from this festival from the tv. Me and my friends are looking forward to witness the Kadayawan Festival this year. Vibrant Colors and Fun Cultural/Street Dancing. Excited! Gusto ko ang concept. It highlights the ethnic tribes. Sana it helps in preserving their culture. And your shots are so crisp, parang di P&S. I should visit Davao. The last time I was there was when I was 12 ata. I haven't seen any of ethnic tribes performing yet. I really want to experience witnessing the Kidapawan Festival. KADAYAWAN po, not KIDAPAWAN (-_____-)"
I FB liked this post because I have already previously G+ this. I have been to Davao but not during this festival time...hope I can go there someday. I miss celebration like this! street dancing and just gala everywhere! wala dito nyan! I have always wanted to witness this event. Hopefully in the near future. Great super post! Now I love DAVAO more! always looking forward for the float parade. sad to say theyve changed the route. the magsaysay route is more convenient. thank you sa pics very nice... mabuhay ang pinas at davao hope to join next time...kadayawan festival.